In our part of the world, today is Father’s Day. In the interests of serving up a decent Eggs Benedict for breakfast, as it is the Bread Winner’s favourite, the Ankle Biters and I struck a deal. I would cook breakfast, First Born would cook dinner and Lil Miss would make dessert. Everyone was happy. First Born has been perusing my dear old Mum’s collection of Women’s Weekly cookbooks which mostly date around the early 80’s for some week now. He chose to cook a decidedly retro little number for dinner. 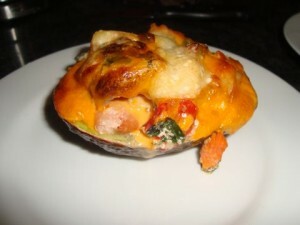 Baked avocado stuffed with seafood, topped with a choron sauce and grated parmesan. Very tasty if not very filling. More an hors d’oeuvre than a main meal. At least it gave me the chance to deliver a lecture on the properties of lemon juice which prevent oxidisation of fruit and French master sauces. I refrained from making him sit a written exam while it cooked. Lil Miss, being only three is a lot less independent. She is still very much at helper stage. 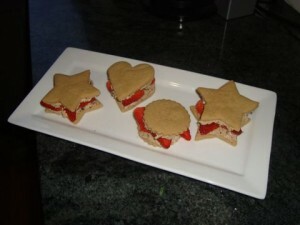 She helped me make thse lovely little shortbreads which we sandwiched with a chocolatey cream cheese frosting and sliced strawberries. Delicious indeed. I use muscovado (surprise, surprise) and turn it into caster sugar consistency in the thermomix. I do enough for the frosting as well at this stage. Bung everything else into the thermomix or food processor and whizz it together until it resembles large breadcrumbs. Remove and ball together. Then gently roll out and cut into desired shapes. Bake at 150 degrees (Celcius) for 40 minutes or until just golden. Blend sugar (or muscovado), cream cheese and butter until smooth. Then add chocolate and blend until it is broken into small flecks (I did this on speed 5 in the thermomix, a food processor should work fine). 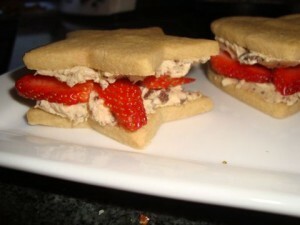 Those shortbread sandwiches are adorable! Delicious too! That cream cheese mix is so naughty but nice. Thanks for your time, I’m off to get some shortbread cooking done! Various for writing about this. There may be huge amount of significantly tech info on the internet. You’ve obtained a multitude of that info content on information site. I am impressed – I try out to normally a couple advise somewhat existing, but it’s a battle every single. You’ve done a solid job with this one. How do will need it?